I spoke with Sean Murphy yesterday about a taco pop-up he’s doing today at Bob & Barbara’s, starting around 6:30. Highly talented, he’s worked at some of Philly’s best restaurants, including as the opening sous chef at Ansill, Cheu Noodle Bar, and Heritage. Brion Shreffler: So, why a taco pop-up at Bob and Barbara’s? Sean Murphy: Ever since my trip to Southeast Asia, I haven’t been working anywhere. So the cashflow is pretty low—I broke the piggy bank already [laughs]. I’ve just been doing events like this. I want to have fun at the same time. Maybe I don’t want any expectations to what I’m cooking. I’m going to serve up some tacos in a bar in Center City. Hopefully people will like it and come by and check it out. Usually, they don’t serve food there but I went there and talked to the manager. I know they get busy on the weekends so I want to do it on a Friday. I know they have young college people that go there—they’re hungry. They want something easy, simple to eat with their hands. For me—that’s tacos. I’m going for a Southeast Asian profile. 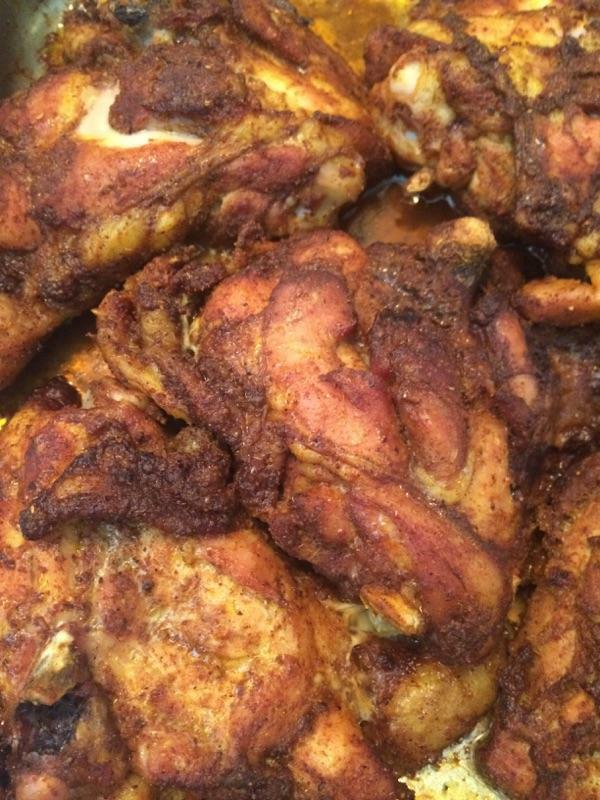 Curry spice chicken. Courtesy of Sean Murphy. I’m going to do a chicken spice curry with pickled daikon. I’m doing a roasted pork belly with stone fruit chutney. How are you complementing the PBR? Oh, man. I’m don’t know how I’m going to do that. Is there jazz in your tacos and do they complement the drag show then? Can we say that that’s all going into these tacos? [Laughs] Well the jazz is Friday and Saturday night but the drag show’s on Thursday. What do you think makes a good taco? Just juice. You’ve gotta have good ingredients. For me, I’m bringing a Southeast Asian flare—papaya and mango salad. So chicken and pork belly tacos. What else? The other day, I found some chicken of the woods mushrooms. They’re a lighter color then hen of the woods–yellow with some red. I’m going to make a veg taco. Braise it in dashi [seaweed broth—in this case without dried seafood] for awhile because these mushrooms are very hearty—you can’t just sautée it for a bit. After it gets tender I’ll give it a good sear. Prep. 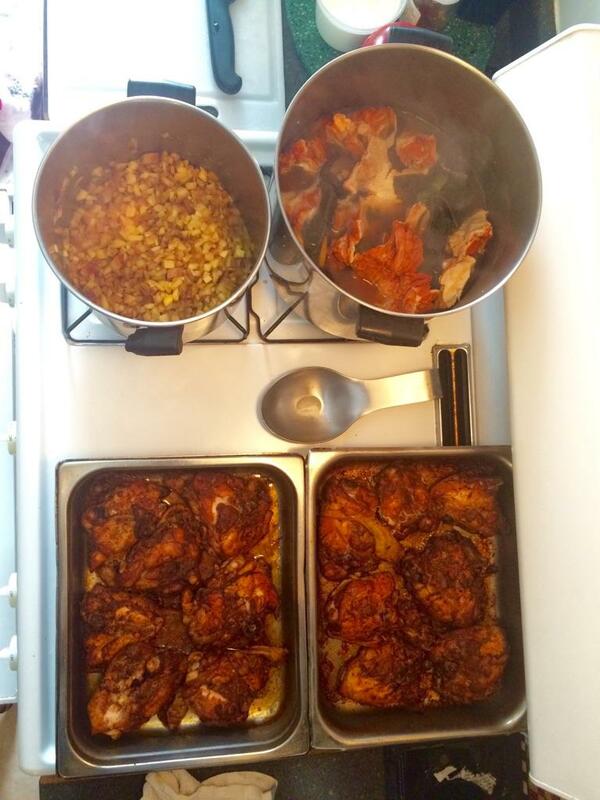 Clockwise from top left: stone fruit chutney; chicken of the woods & charred tomatillos; curry spice chicken. —Courtesy of Sean Murphy. How exactly are you cooking the other two? The pork belly is really simple. I’m salt curing it for a day or so and then simply just roast it until it gets a really crispy skin—prob about two hours. How long for the chicken? Yo, why don’t you let that marinate for awhile, Sean Murphy?! It seems like you’re saying that what makes the best tacos is the deep rich flavor you get either from marinating or cooking something for a long time. Yeah. I’m taking a simple ingredient and adding accents to it. Basically, with the curry spice chicken, I’m going to have charred tomotillo sauce in their as well with small pickled leeks. 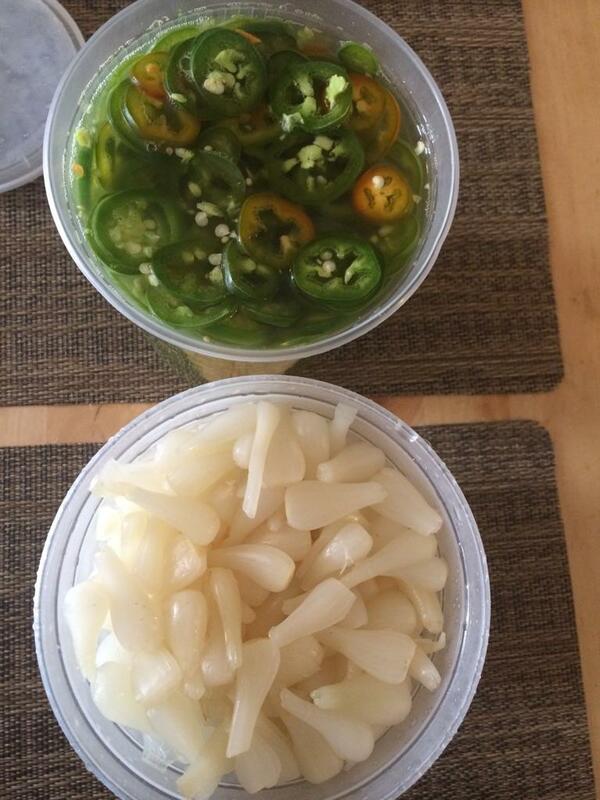 Pickled jalapeños & baby leeks. –S.M. How much prep do you have done? Mostly, just all the pickled stuff. All the meat is going to be cooked the day of. I don’t want to do too much. The tortillas I’m going to make by hand from ground corn meal tomorrow. When you’re not cooking, where do you get your tacos from? I like to order late-night tacos. Prima La Fonda. They deliver to you at like three in the morning. When you’re hungry and drunk—that’s the crowd I’m trying to get at Bob & Barbara’s. That’s exactly what I’m talking about. The tacos at Prima are all about that slow cooked, deep rich flavor. I’m doing that in a different style. Yeah, you better come out. It’s $7 bucks for three tacos. Okay, as long as you’re not throwing flowers on there and charging me $12 for two half-tacos. Back to Prima La Fonda—what type of tacos does drunk Sean crave from them? Tacos de lengua! My girl thinks they’re disgusting but I don’t care—I’m eating the good stuff. 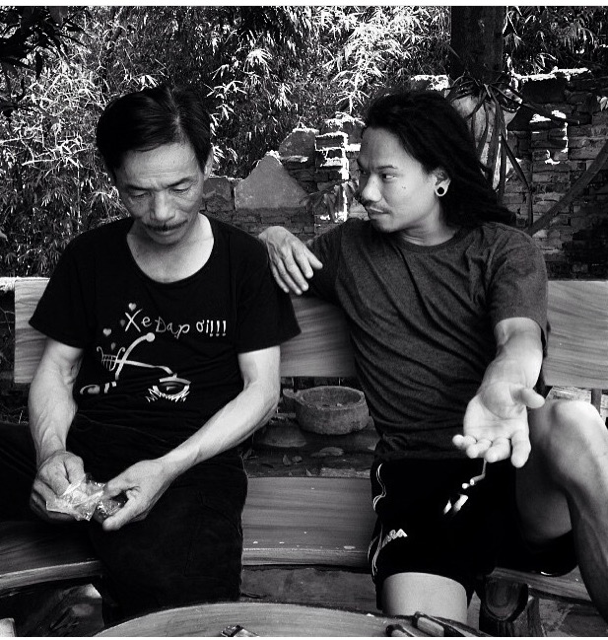 Sean Murphy with his uncle in Vietnam.— Courtesy of S.M. Photo by Rob Marzinsky. Where are you in terms of stages of drunkenness when you call them? 1-10? I’d say a 6. But don’t get me wrong, I don’t think they’re good because I’m drunk. They’re good no matter what. I’ve never been there myself, but the delivery guy knows me really well. How do you think you’re going to surprise people? I think people are going to be surprised that there’s this Asian guy in the corner making tacos. But your food’s going to tell them. That’s to be seen. This is my first time there. How much I make will tell me and maybe I’ll come back next weekend. That’s what it is. If people notice. More in tacos: The story behind South Philly Barbacoa & trying SPB’s brain tacos.